You'll be £25.00 closer to your next £10.00 credit when you purchase Fortress Island Malta. What's this? The most intensely bombed place on Earth, Malta’s survival and offensive actions are the stuff of legends. A very small population, on the brink of starvation, held out against a mighty aerial armada for some three years in an epic fight to survive and strike back. – Highly Recommended. The island of Malta has been used as a military base in the Mediterranean by Britain since the 19th Century, but its importance was never more vital that during WWII. In June 1940 the Italians bombed the island, with a view to reducing its operational value. Yet, the more it was attacked the grater its importance became and had to be supplied. This is the story behind how the island was supplied and continued to be a thorn in the side of the Axis forces. The author does an excellent job in telling the history with well-researched evidence and first-hand accounts. The urgency of the island's defence comes through, along with the desperation to survive. A very accessible read and a good reference work to have on your shelves. 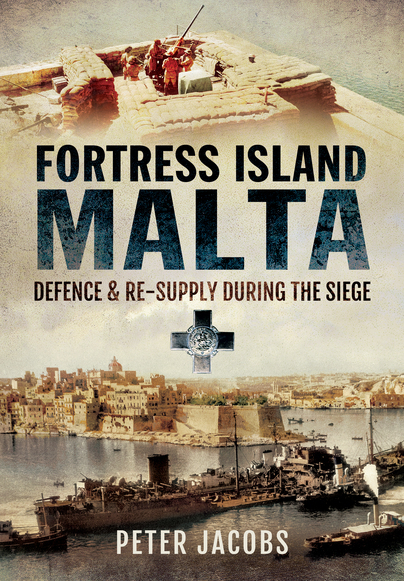 ... Peter Jacobs recounts the story of the island’s defence and resupply clearly and dispassionately. As he notes, this is only part of the story, but those exploring other aspects of the siege, such as the attitudes of the civilian population or Axis strategy in the Mediterranean, will find Jacobs’s work an invaluable starting point, with a comprehensive bibliography and guide to the siege papers in the UK National Archives. For the general reader, Jacobs has produced an excellent tale of human courage and endurance. I'll start by saying this new book from Peter Jacobs and Pen and Sword is a really good read. In 18 chapters, the author tells us the story of one of the most famous sieges of WW2. After some background on the Strategic Position of Malta it moves on to the first day of the siege, as for the end, there are differences about exactly when that was. Some take it as the end of the Axis air raids, in October 1942 while others look at the arrival of a significant re-supply convoy, in December 1942. That final stage in the story is left to the final chapter.